The Boys & Girls Clubs of East County (BGCEC) has announced more than $5.6 million has been raised towards a goal of $9.4 million for its fundraising effort called the “La Mesa Capital Campaign” that includes construction of a new 25,000-square-foot clubhouse on the campus of La Mesa Arts Academy, previously known as La Mesa Middle School. BGCEC officials said recent donations have been received from the following: the Justo family that owns ASI Hastings Heating, Air and Solar; San Diego Las Hermanas, a San Diego philanthropic organization; the Tipton family that operated an auto dealership for many years; James and Christine Renner, owners of Inland Pacific Commercial Properties; and, the La Mesa Women’s Club. Higgins also said approval for the new clubhouse has been received from the California Division of the State Architect (DSA), the governing body for construction on public school campuses. “We have met the stringent requirements and now we’re shovel-ready from a permitting standpoint,” he said. In related news, the City of La Mesa said it recently received a $1.9 million grant from the California Department of Transportation to improve sidewalks, improve traffic circulation and add a high-visibility crosswalk at Lowell Street and Junior High Drive, an intersection leading to the middle school campus and the BGCEC facilities. The grant also will complete 4.8 miles of bicycle and pedestrian paths linking the west La Mesa neighborhood’s schools, including La Mesa Arts Academy, Helix Charter High School and La Mesa Dale Elementary School to parks, bike paths, transit and other key community destinations. Environmental work is scheduled to begin in fiscal year 2016-2017, city officials said. The BGCEC’s La Mesa Capital Campaign includes funding for the new clubhouse on the west end of the middle school campus as well as renovations completed last year to an existing teen center also located on the middle school’s property, plus an endowment to operate both facilities. When completed, BGCEC officials said both the Brady Family Teen Center and Brady Family Clubhouse would serve up to 400 children a day, ages 5 to 18. Roughly one third of the $9.4 million goal for the La Mesa Campaign came from Ron and Mary Alice Brady, owners of the Brady Companies, a La Mesa-based construction company specializing in metal stud framing, drywall installation, doors, frames, and acoustical ceilings. In 2014, the Brady’s pledged $1 million to renovate the existing teen center, which was renamed the Brady Family Teen Center, along with $2 million to help build a new yet-to-be constructed clubhouse to be called the Brady Family Clubhouse. The previous renovations to the Brady Family Teen Center on the middle school campus included an exterior face-lift and interior upgrades, including flooring and carpeting, new furniture, computers and a security system. The existing teen center, opened in October 2006, is a popular home-away-from-home for La Mesa’s 11-to-18 year olds. 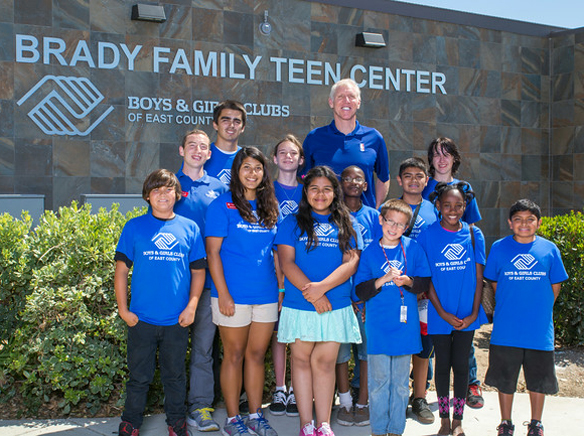 The new 25,000-square-foot Brady Family Clubhouse will be the largest of the six Boys and Girls Clubs of East County. The clubhouse will feature a learning center called The Academy, a full-service kitchen and nutrition center and Little Rascals area for 5-to-7-year olds, plus a 10,000-square-foot Bill Walton Gymnasium, named after the La Mesa native, Helix High graduate (class of 1970), former professional basketball player and current broadcaster on National Basketball Association (NBA) games. South said donations range from $500 to become a “builder” on the donor wall to $300,000 to fund a game room or playground for young club users. A donor’s name on a an outdoor play structure will run $100,000, while $30,000 is being requested for either a check-in counter, set of outdoor bleachers or a director’s office. Sponsoring a backboard or a scoreboard is $20,000, while purchasing office furnishings or equipment for the nurse’s station is $10,000. After going over a handful of the blog posts on your web site, I really appreciate your way of writing a blog.